Quarry owner Larry Mosler lost his bid to get the county Planning Commission to overturn 14 violations assessed against his mine north of Ojai. Voting 4-0 with one commissioner absent, the panel sympathized with Mosler’s struggle to meet layers of federal, state and local rules. But commissioners concurred he was responsible for the violations cited by the county planning staff. County planners have cited the Mosler Rock/Ojai Quarry for 14 violations, all of which were upheld Nov. 18 by the Ventura County Planning Commission. Planning Director Kim Prillhart has said she would like to settle as well but that Mosler needs to amend his permit if he wants to operate outside the conditions. A date has not yet been set for the hearing. Meanwhile, a new 'desilting basin' is being constructed in response to regulatory agencies concerns. A few large boulders were also removed this summer to help alleviate fish passage problems, although barriers exist throughout this reach of the creek. We will have to wait and see if these actions make a difference in water quality and fish passage. 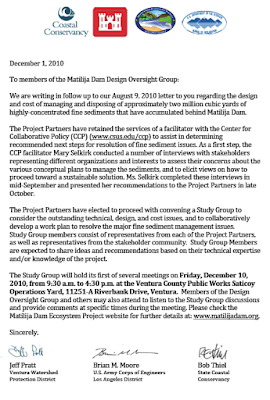 Last week the Corps of Engineers sent a letter to the Matilija Dam stakeholders that provides an update on the process and next steps. According to the letter, the designated Project Partners will convene a Fine Sediment Workgroup and will host a series of meetings starting this week. 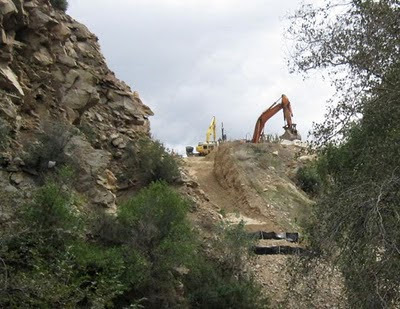 We are writing in follow up to our August 9, 2010 letter to you regarding the design and cost of managing and disposing of approximately two million cubic yards of highly-concentrated fine sediments that have accumulated behind Matilija Dam. The Project Partners have retained the services of a facilitator with the Center for Collaborative Policy (CCP) (www.csus.edu/ccp) to assist in determining recommended next steps for resolution of fine sediment issues. As a first step, the CCP facilitator Mary Selkirk conducted a number of interviews with stakeholders representing different organizations and interests to assess their concerns about the various conceptual plans to manage the sediments, and to elicit views on how to proceed toward a sustainable solution. Ms. Selkirk completed these interviews in mid‐September and presented her recommendations to the Project Partners in late October. The Project Partners have elected to proceed with convening a Study Group to consider the outstanding technical, design, and cost issues, and to collaboratively develop a work plan to resolve the major fine sediment management issues. Study Group members consist of representatives from each of the Project Partners, as well as representatives from the stakeholder community. Study Group Members are expected to share ideas and recommendations based on their technical expertise and/or knowledge of the project. 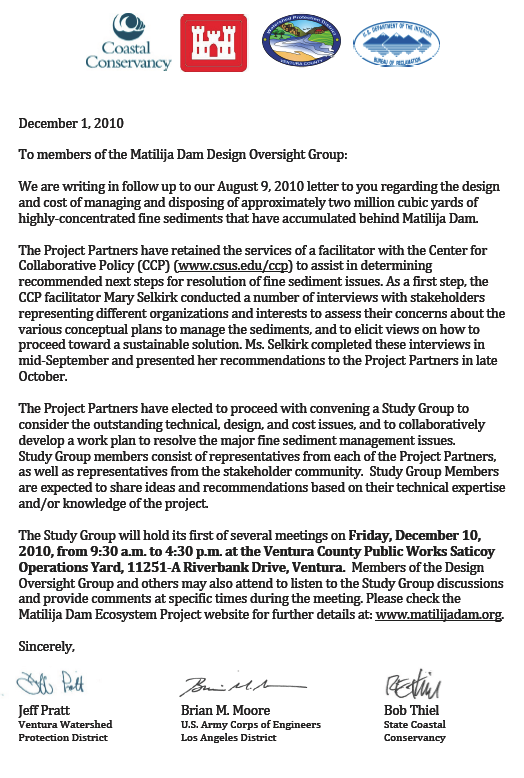 The Study Group will hold its first of several meetings on Friday, December 10, 2010, from 9:30 a.m. to 4:30 p.m. at the Ventura County Public Works Saticoy Operations Yard, 11251 Riverbank Drive, Ventura. Members of the Design Oversight Group and others may also attend to listen to the Study Group discussions and provide comments at specific times during the meeting. Please check the Matilija Dam Ecosystem Project website for further details at: www.matilijadam.org.